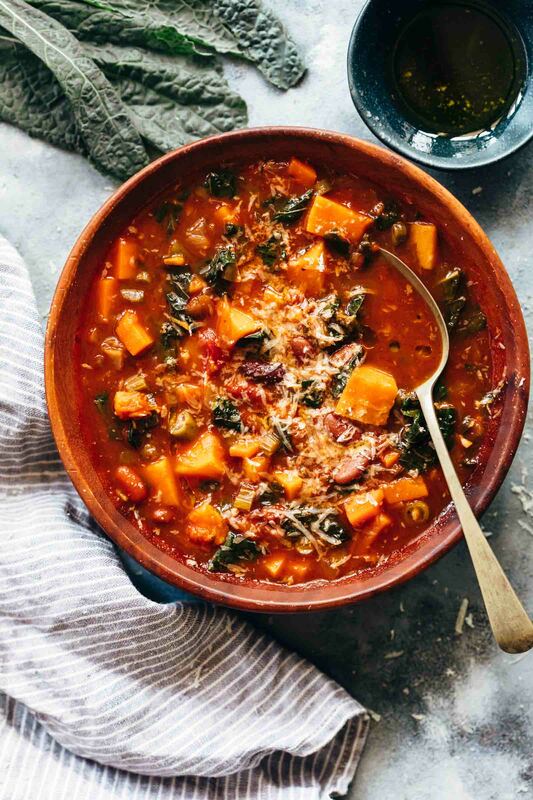 This vegetarian minestrone soup is the best way to use up winter veggies like butternut squash, kale, beans, carrots etc. Combined with a delicious tomato base and beans, this soup checks all the right boxes – healthy, hearty, filling, flavourful and loaded with veggies! Hey there! Soup season is still here and I can’t be happier. 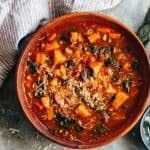 If you are not a soup person treat this vegetarian minestrone soup as the easiest way to load up on veggies and all good things and go with that. Traditional Italian minestrone soup has its base in a fresh tomato sauce that’s seasoned with herbs, veggies, some kind of meat and pasta. But I really wanted to keep this light on the stomach but still hearty. So last week for dinner, we opened the refrigerator, rummaged around for all the winter veggies that were stocked in there and made the most delicious stew like soup. And we didn’t miss the pasta one bit! 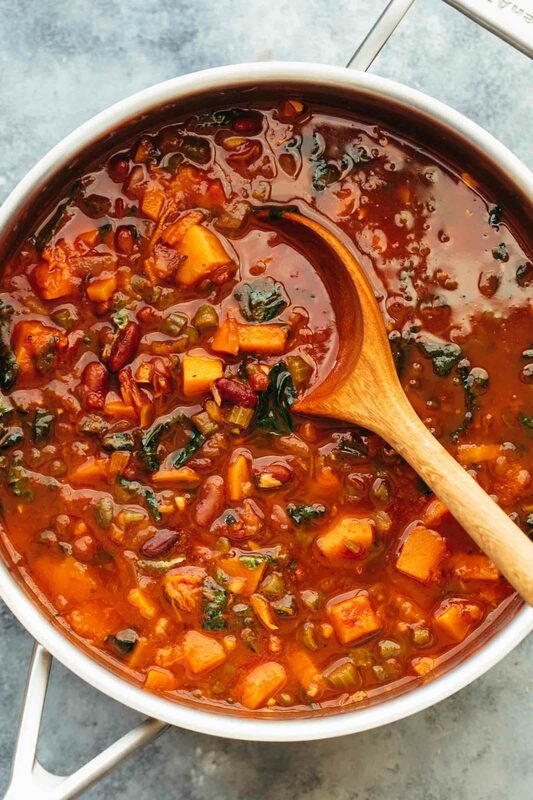 This is truly a one pot soup because even if you wanted to add veggies, you can just add them right to the pot towards the end and let them cook. The pasta will thicken the soup further so you will need to add more liquid. But if you are like me, and want to skip it, add your favourite beans or even lentils and trust me, this will still fill you up nicely! There are no rules when it comes to making this vegetarian minestrone soup at home! I used a store bought chunky marinara sauce because it already has herbs and is full of flavour and saved me the time of cooking the tomatoes from scratch. The same applies for what vegetables you use. A lot of vegetables can be used in this soup. 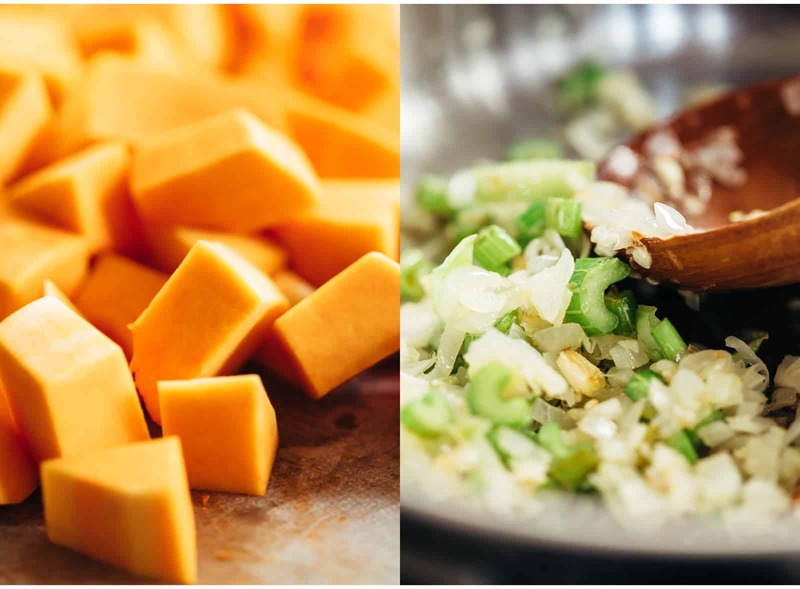 Starting with root vegetables like potato or sweet potato to more seasonal veggies like squash, pumpkin, and greens such as spinach and kale. There are quite a few veggies that go into this version – onions, celery, carrots, butternut squash, french beans and kale. There is added nutrition from kidney beans which can be substituted with any of your favourite cooked beans. Traditionally, Italian minestrone soup uses some form of pasta or rice. You can add pasta to this recipe by adding 1/2 cup dried pasta along with the french beans along with 1 1/2 cups water or stock. The additional liquid is required to cook the pasta, and because the starch in the pasta will thicken the soup considerably. If you’ve been following along for a while, you know that I’m not one for boring insipid soups. If I’m eating soup, I want it to be hearty, usually thick and full of flavour. And this vegetarian minestrone soup hits all the right notes! « Sticky Thai Meatballs – Quick and Easy Party Appetizer! winter vegetarian minestrone soup is abest in winter. this is one of my favorite recipe. winter vegetarian minestrone soup is a best in winter.this is one of my favorite recipe. Wow! Looks so good. Keep Inspiring Your followers & emailers, so they get delicious food to eat.